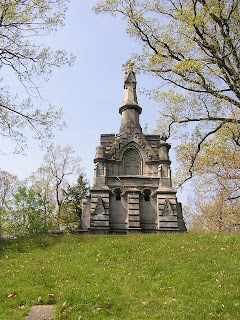 Many of us enjoyed PACNY president Jeff Romano's tour of Oakwood Cemetery last summer, when he pointed out the stories behind the graves of those for whom Syracuse Streets are named. 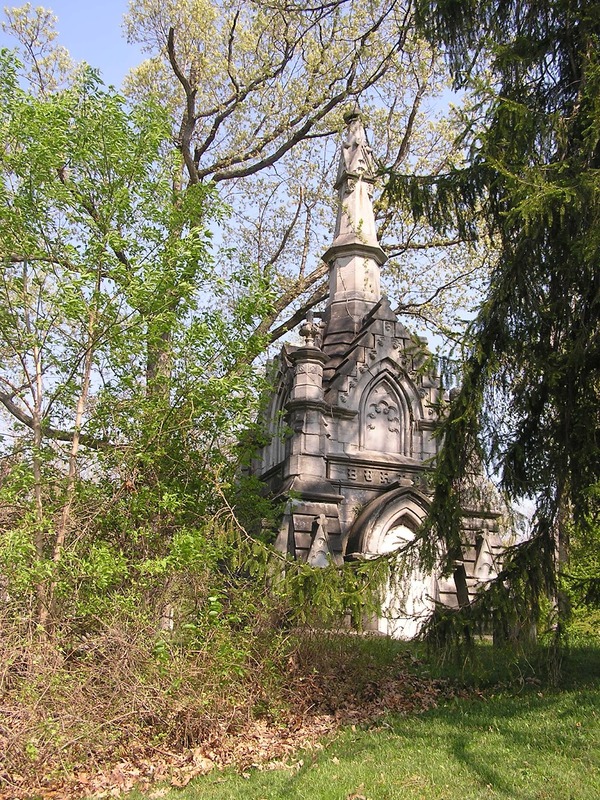 This week Jeff leads of tour for the Historic Oakwood Cemetery Preservation Association (HOCPA) of the tombs of the city's Salt Barons on Thursday (July 26th) at 6:30 pm. The tour begins at the Chapel. enter at Comstock gate and follow the tour signs. The tour takes place train or shine, but will be canceled if there is thunder and lightning. Wear comfortable shoes. I'm looking forward to this tour, in part because on August 26th I'll be leading a walking tour of the Washington Square area, where many of the "Barons" presided when they were among the living. 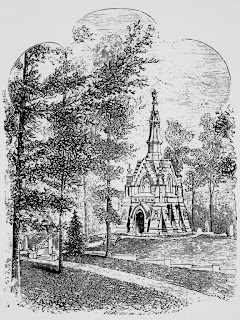 At Oakwood, I assume we'll visit the tomb of Burr Burton (1804-1865) in section 12. 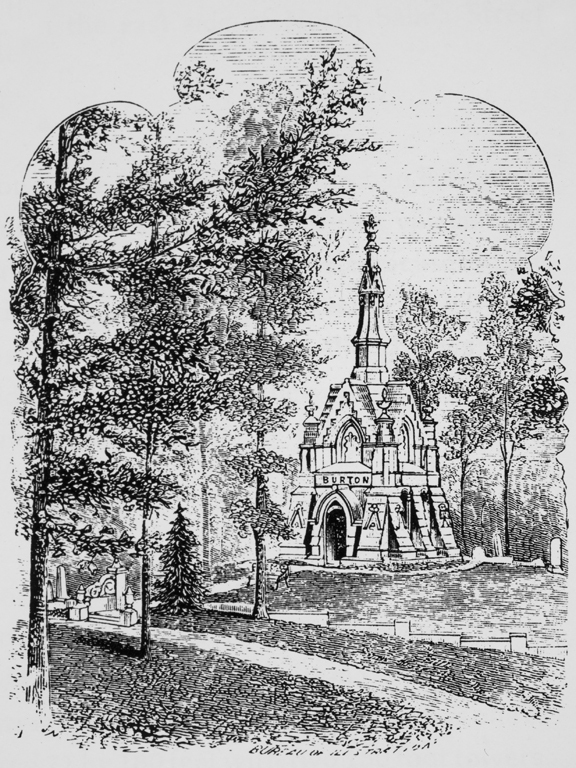 Burton was a leading salt manufacturer, and former state assemblyman who was shot and killed in his home in 1865 by an unknown assailant. I guess gun control was a probable after the Civil War, too. 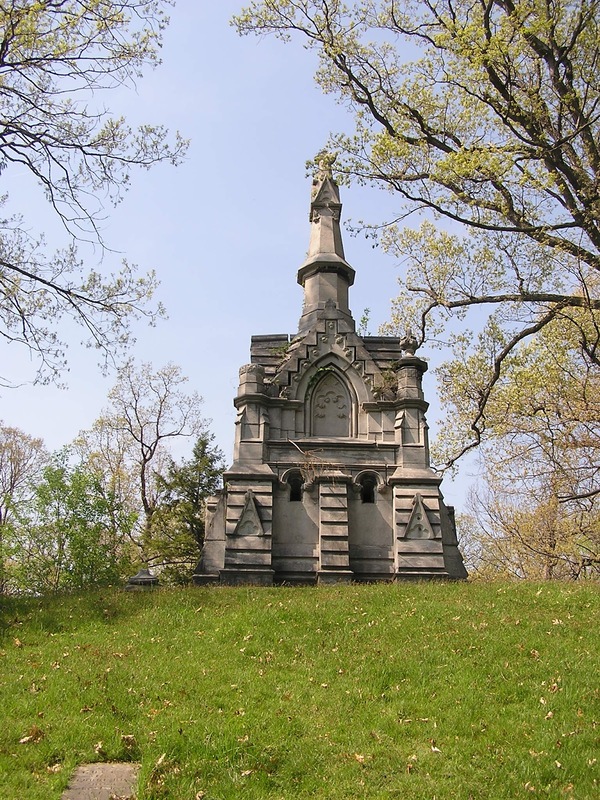 The tomb was designed by Horatio Nelson White, Syracuse leading architect at the time. Built of Onondaga limestone it reportedly cost $8,000. Read more about Burton on the Shades of Oakwood website. For more information about the tour contact Connie Palumb at 315-415-2954. I ride my bike a lot - I ride to work and ride downtown and I ride to explore different neighborhoods. I learned urban riding when I was kid in Center City Philadelphia, then in my high school years in Rome, Italy, and later biking for sixteen years in Manhattan. Except for some of the hills, I've always thought biking in Syracuse is a breeze. I like having bike lanes - when they are good ones - but really I've always felt traffic is so light here, and that there are so many one way streets, that getting around (except on Euclid Ave!) has never been a big problem (for me). 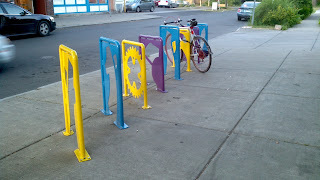 What I am always looking for, however, are good bike racks. 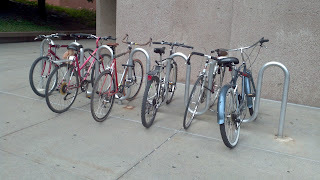 Having had three unlocked bikes stolen in Syracuse since 1993, I am maniacal about locking my bike even for the shortest time, even if I'm sitting nearby. 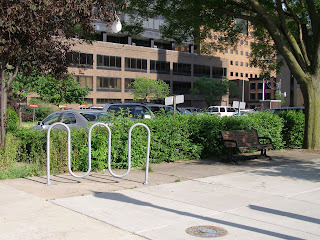 Finding good bike racks in Syracuse, however, has always been tough. But it is getting better. 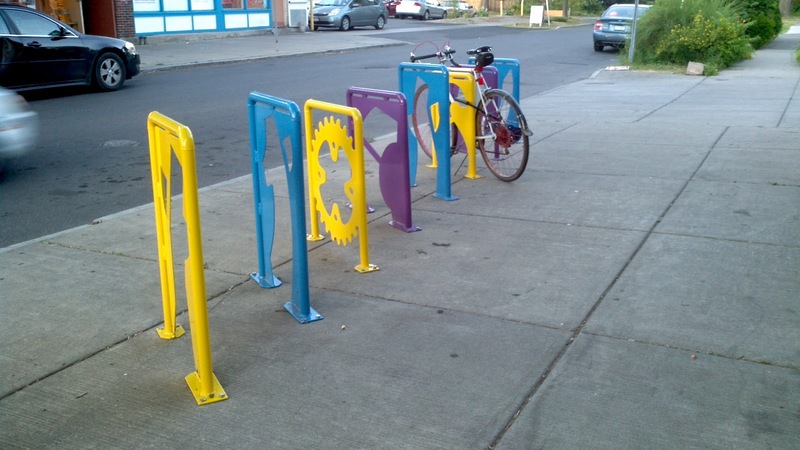 We recently welcomed the newest and brightest new bike rack on Harvard Place at Westcott Street, a project organized by 40 Below's Public Arts Task Force and designed by city artist/architect Brendan Rose (of Armory Sq/Creek Walk dragon fame), the simple colorful design combines strong pipe poles and cut metal sheets. The placement was clearly tested by a biker - since there is plenty of room for every type of bike, and most kinds of locks. Look carefully, the cut-outs spell "Westcott". I guess "Harvard" was thought to be too elitist (not so a hundred years ago when residents successfully petitioned to change the name of Phelps Street to Harvard Place). Brendan has previously designed the sign at the Lipe Art Park. 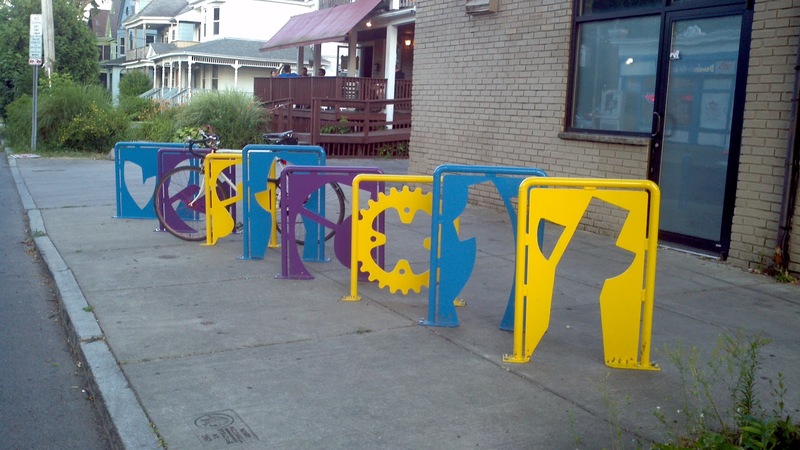 More creative bike racks can enliven our city streets and parks. Here is inspiration from Detroit - a downtown bike rack I saw when there last April. These models can be purchased from Belsen. Click here to see some more Detroit racks. 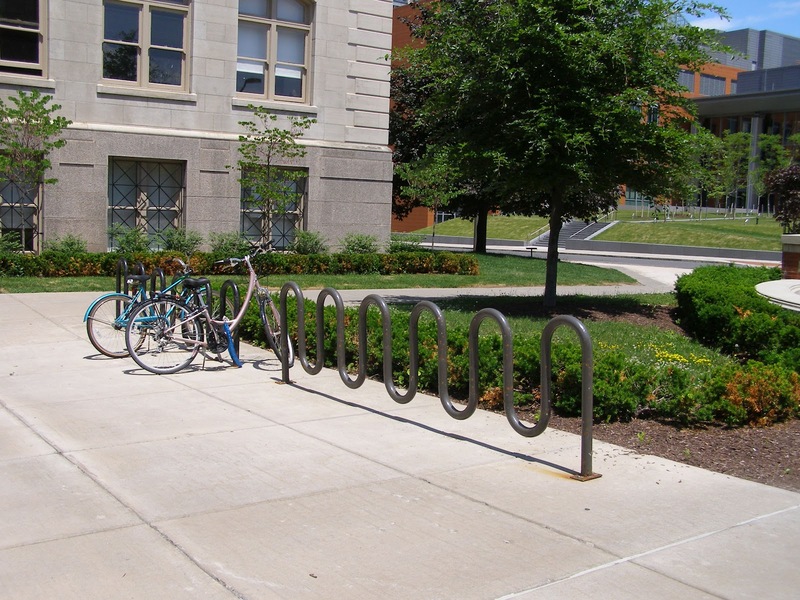 This is my favorite bike rack - the one at Bird Library I use everyday. In my experience this design is the most functional. 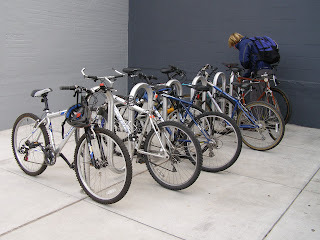 Bikes can be parked form either side, and squiggly pipe take every wheel size and handlebar width, and bikes can be locked with U-locks or chains. No wonder this rack is always filled (and the overhand of the library roof keeps off most rain). This is probably the worst rack in the city and its right across from City Hall. I use it whenever I bike to public meeting, and I'm always wondering whether my bike will still be there when I get out. Besides being small and ugly, it is so badly bolted to the sidewalk a heavy man could lean on it an break it loose. so what sort of message does this City Hall rack send. Here are two more good SU racks. The tops one is from the Warehouse - though I think it has been moved due to the present construction work. 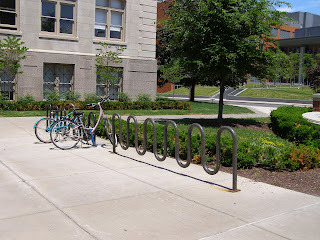 The other is on campus - taken on a weekend - since during the week the rack is filled with bikes. The rack above is the one that has been on the corner of Marshall Street and University place for years. space for three bikes for all those shops and restaurants! It works but it is set amidst a lot of street clutter. It gets a lot of use since the rack in front of Marshalltown Mall is not good - its pressed too close to wall so wheels cannot be inserted for locking. I haven't tried the new racks on the Connective Corridor (I and I have not seen anyone else use them either. I report on them when I have. Lastly, for this blog post, here is an unusual rack at SUNY-ESF. Bikes hang like sculpture from rack/brackets fastened to the concrete wall. What bike racks do you use? 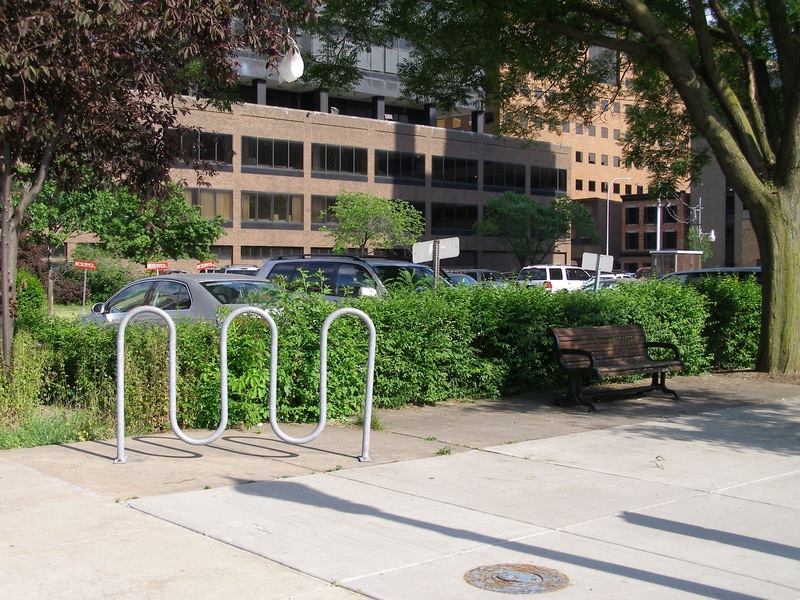 Where do look for bike racks but cannot find them? Let me know. I was ecstatic to get a call yesterday informing me that some of the ideas I'd been promoting, and rumors I'd been hearing about the future of the Gustav Stickley House on Columbus Avenue, were converging on the same course, and that Everson Museum director Steve Kern and L. & J.G. Stickley Company CEO Aminy Audi would be making a big announcement soon about the historic house, with its iconic Craftsman style interior. I've known for months about Steve Kern's enthusiasm for the house, and that talks were in the works. The Preservation Association of Central New York identified the Stickley House as community priority at its annual meeting. But I was never certain that a bold step would be taken, and a threshold crossed. Here is the story from the syracuse.com and this morning's Post-Standard. ...And then there is the best case scenario...this would take option three, but ratchet it up a notch so that the Stickley House would not just survive as working house, but would be turned into a full-service research and exhibition center for Central New York's famous (and continuing) Arts & Crafts Movement. Under the auspices of OHA and/or the Everson, the house would be restored supported by nationally-gathered tax-deductible donations and tax-credits where appropriate. The house would have galleries for permanent and temporary exhibitions, office space and still (perhaps) house a top floor caretaker's apartment. The house would function as a satellite museum with regular hours. There would be difficulties beyond the money (minimally many millions of dollars for restoration, installation, security, curatorship, etc.). A zoning change would be needed. Parking would be required - perhaps including the demolition of at least of the later structures on Columbus. But still... I can cite the success of many similar projects in this country and abroad. Tthe idea is a idealistic, but also realistic, and should be seriously considered - and championed. Late yesterday afternoon Syracuse.com broke the story the the Everson and the Audi family would move ahead - or at least try to - with plans to make the house an Arts & Crafts center and a satellite museum of the Everson. Given Stickley's pivotal role in the movement, the Everson's existing strengths in this area, and the importance and achievement of so many regional Arts & Crafts artists, this makes good sense. I had always imagined a study center, with scholars in staying in Stickley's own house. But Steve Kern and Crawford & Stearns architects are thinking bigger, and envision an actual exhibition center. Much needs to be done, but close examination of the building - both its condition and its spaces - has confirmed that such a new life is indeed possible. This is what a large local community of neighbors and a national community of Arts & Crafts enthusiasts have hoped for a long long time. It will not be easy. While internationally the $2 million price tag is a pittance for a major cultural attraction, and in NYC or LA, or even in Skaneateles there are kitchen rehabs that cost a good fraction of this, for cash-strapped Syracuse this is a big step. Still, as I have written before, I believe this is a project that will generate funds outside of the region to make it happen. Much is also riding on initial funding from the Regional Economic Development Council. For this, Central New York residents need to voice their vocally their support to their political representatives and cultural leaders. I have great faith in Steve Kern's ability to make this happen. In early September I will be reprising my walking tour of last March of the Columbus Avenue neighborhood. As before, we'll stop at Stickley House for another long discussion. This time we will be cautiously optimistic. The congregation of Temple Concord, Central New York's oldest Jewish organization, continued its celebration of congregational history and the distinction of its fine 1910-11 building, the centennial of which was celebrated last year. In June, two plaques were installed noting the placement of Temple Concord on the National Register of Historic Places. The nomination of the building, which was researched and submitted to the State historic Preservation Office with help from the International Survey of Jewish Monuments (ISJM), led to the designation in 2008. Temple Concord provides office space to ISJM in the 1920s former education wing, behind the main sanctuary. The unveiling of the plaque on the sanctuary facade, facing University Avenue, took place after the congregation's annual meeting. A second plaque is in the Temple complex lobby, which is entered fom the parking lot on Madison street. With the newly opewned Connective Corridor on University Ave. with 2-way traffic, the new bike path, and new landscaping, the original west-facing Facade of Temple Concord will be getting much more attention than it has in recent years. Too bad it looks out on a parking lot! The fabrication of the plaques was made possible by a gift from the Dorothy and Marshall M. Reisman Foundation. I would love to see more such plaques and other types of notifications marking the historic sites of Syracuse and Central New York. Here are some photos from the unveiling, courtesy of Mark Kotzin. Rabbi Daniel Fellman presided. Octogenerian and still-energetic congregants Mike Moss and Alex Holstein helped with the unveiling. Both Mike and Alex were active in getting started the National Register process, getting these plaques up, and the entire building centennial celebration. Mike's parents were married in the sanctuary soon after it opened and Alex's grandfather was on the Building Committee. Whatever remarks I'm making (above), I'm not sure the rabbi and Mike agree, or maybe I'm was jsut going on too long! For more on the history and architecture of the building click here.